Cafe de Paris' sensational cook, Ayoub Abdelmoula, hails from Casablanca, Morocco. Drop in and say Assalam to Ayoub and Bryn. 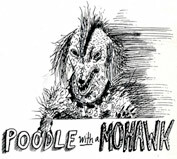 Keep an eye out for three Standard Poodles who frequent Historic Downtown, one with a traditional cut, one with dreads, and one, you guessed it, with a mohawk. A warm Historic Downtown welcome to Beth Barrett, the new director of the Louisville Public Library. Happy 125 Anniversary to Saint Louis Catholic School. The new Fall menu has debuted at the Empire Lounge! On your way in don't forget to check out their sign... all lit up and pretty again. Happy 2nd Anniversary to Waterloo! Look for special events at the Main Street watering hole Sept 21 - 28. Congratulations to Susan and Kathy at The Market Place Bakery and Nicole and Jenny at A Grande Finale Patisserie! These Downtown businesses are currently being recognized as two of Colorado's best in the Channel 7 A List Contest - if one of them wins it would be icing on the cake! To vote for your favorite, see the standings, and read and write reviews please click here for The Market Place Bakery and here for A Grand Finale Patisserie. There are anniversaries and then there are Anniversaries - The Blue Parrot is celebrating their 90th! Can you believe the same family line is still keeping this historic restaurant going successfully for 90 years! Go and enjoy their Italian cuisine and make your own memories as soooo many others have over the years. As you are exploring this block stop in to see the new Insight Subluxation Station at Achtermann Chiropractic and Massage. Dr Karen and Dr Marty Achtermann have been practicing in Louisville for 14 years. Visit them at 600 Main Street, 303-673-9797. Support Andy and Kelly and vote for the Louisville Farmers Market in the "Love Your Farmers Market" online contest. Every vote helps promote local food, family farms and sustainable agriculture.